Most people focus on the spectacular shots and miss the true dynamics... consistency and control! The pros are not always going for winners! Watch as they strategically move the ball around looking for an opening to go for the gold. Most club players play in what I call the "hit winners mindset," always trying to do something spectacular. Not so with the pros! Watch for deep approach shots as the pros venture to the net. But then watch how easily they get passed when they hit a short approach shot! 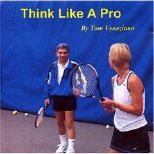 When pros come to the net and get passed, do they think to themselves, "I'm not going to do that again, I got passed"? No, instead they wait for another opportunity to put pressure on their opponent and come up to the net again. I've watched many club matches and if one player comes to the net and gets passed or lobbed over his head, that's it for coming to the net....they just stop! The pros are relentless in their pursuit to keep pressure on their opponent. Watch for up and down cycles in the match. First, one player has the momentum, then the other and so on. Cycles are part of matches and should be understood as reality, so when you are in a down cycle just keep plugging along. 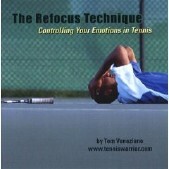 Good and bad cycles on the tennis court will always repeat themselves. Your job is to think like a pro and deal with them. Watch for the pros to split-step every time their opponent hits the ball -- ready to run quickly in any direction. If you are not familiar with the split-step, watch when one player is returning serve. You will see the receiver jump a little off the ground and land with his or her feet spread apart; this is called the split-step. Watch how the pros warm up slowly. A pro is not trying to win the warm-up by blasting winners! What do you do when you warm up? Remember, when watching a professional match, keep your mind off the spectacular and on the control and consistency that is the signature of a champion!